Pondless waterfalls exchange the open water of the pond for a gravel-topped excavation; maximizing visual impact while minimizing headaches and maintenance. 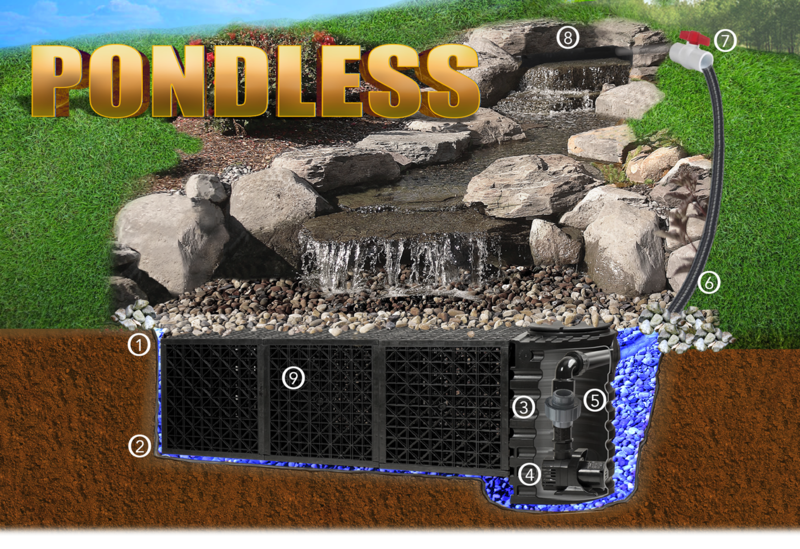 Design your pondless waterfall at The Water Shed in Vancouver, WA. Our in-store design team will help you create the feature yourself or connect you with local professionals to perform the labor. We’ll work with you and the contractor to make sure that your interests are always put first. We are your one-stop pondless waterfall consulting home. 8 oz felt fabric that goes under the liner to help protect from rocks and roots. 45 mil EPDM liner. Thick and durable. The pump vault provides easy access to the pump, union, and ball valve. The pump determines how much water is being pushed over your waterfalls. Our in-store design team can help you determine the necessary flow to get your desired effect. This free-spinning fitting allows you to disconnect the pump after all of the glued fittings have been installed. PVC Flex tubing. Pump flow will determine what size tubing to use. Controls the flow through the fountain. Allows you to fine-tune the sound. Gives the water a place to gather up and flow evenly over a lip. Void filler basins consist of 10% basin and 90% water. Gravel fills consist of 70% rock and only 30% water.